What is LOVE, Dr. Cookerly? : Getting Yourself Heard: A Big Important Self-Love Skill! Getting Yourself Heard: A Big Important Self-Love Skill! Synopsis: What being well heard consists of; its many faceted importance to your life and loves; and the basic how-to's of getting started on making it happen are presented here. What does it mean to be heard well? To get yourself heard well you had best first understand an answer to this question. I suggest it means that someone cares enough, and knows how to listen to far more than just words and what they mean in the dictionary sense. 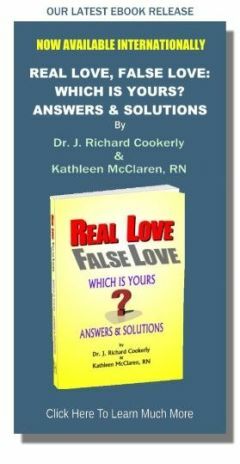 It means to pay attention to the feelings being expressed in tones of voice, facial expressions, gestures, and posture changes (see “How to Talk Love Without Words”). Sometimes it means listening to what is not being said with words but maybe implied, hinted at or satirically (or euphemistically) verbalized. Mostly it is hearing the emotions along with the meaning of the words. 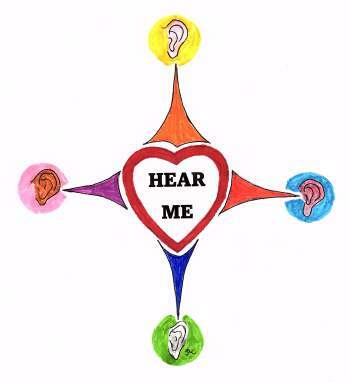 To be well heard, also usually means that the hearer is what is termed an active listener. Active listening involves good eye contact, occasionally making small empathetic sounds as the talker talks, having a great many different facial expressions appropriate and corresponding to each thing the talker communicates, shifting body postures indicating attentiveness and care, and doing gestures that represent being with and for the person being listened to but not necessarily in agreement with whatever is getting said. This especially is important if you are listening to people in disagreement with each other. To hear well with love, means to have and convey loving care as you listen. Those who lovingly hear well, do well to ask themselves over and over, "am I really showing I care about this person I'm listening to". I have had a part in training a wide variety of counselors, nurses therapists, psychologists, caseworkers and psychiatrists. Some knew how to listen accurately but not lovingly. Some knew how to listen actively, and that helped, but when loving care was absent, clients/patients knew it. Genuineness in loving care is very important as one attempts to listening well with love. The same is true for spouses, parents, dear friends, lovers and even in the way you listen to yourself. I get asked "Are not the words said important?" Yes, they are very important but more with some people and situations than others. For a great many to whom words and their meanings have high importance, focusing on and having memory for the words they say is imperative. For a great many others, words are clumsily inaccurate stabs in the dark for what they are trying to get across. Those who listen well can reflect back what you just said and also label an emotion they think you were feeling as you said it. Silently they are repeating what you just said to themselves so that they can remember it and simultaneously registering an interpretation of your emotions. Those who listen well are well practiced at doing this so it comes kind of automatically for many good listeners. Vocabularies vary greatly. So do styles of speech, use of colloquialisms, slang, jargon, code use, fad terms and even cadence and rhythm. There are a great many parts to listening well. One of the signs of those who listen well is that they can identify what they are not sure about and easily ask questions about it. For instance, a person who listens well might occasionally say something like, "I know I'm interrupting a bit but I want to ask about something. I noticed you really sped up when you started talking about person X. Do you have a feelings or thoughts about that?". Does Your Silence Get Listened to? There is a saying "silence screams the loudest". Those who listen well also listen well to your silence and often hear a lot in that silence. They do what is called hearing with their eyes. If it seems you are stuck, they might softly say something like, "Think out loud, maybe?" Listening well means NOT just pause listening (only listening for pauses so the listener can start saying their stuff). They also do not over talk other’s speech and, thus, demonstrate they are not listening at all. Nor do they give not-asked-for advice, or try to answer questions that are not real questions but only statements in question form. Also they do not attempt to tone-down harm-free, cathartic expression. Nor do they attempt to block, suppress or limit obnoxious, profane, bizarre, irrational, degrading, sexual, anti-decorous and antisocial verbal expression before their cumulative meaning has been heard and well listened to. Yes, there is quite a lot to this thing we call good listening and getting yourself heard well. Why Do We Need to Get Ourselves Well Listened Too? The simple answer is because it does us a tremendous amount of good. For one thing, well listened to people get to feel well loved. Well loved people are healthier, function more happily and are more productive than not well loved people. Another reason has to do with the way our brains work. It turns out we listen to ourselves better when we say things out loud. It is even better when we talk to others who listen well. Silent thinking can be quite good but if emotions are involved, even happy ones, it is better to have a loving listener or at least a good listener participating. The process of being lovingly listened to quite well is a process which seems to trigger all sorts of healthy neurochemical and neuro-electrical functioning in our brains. This, in turn, reduces loneliness, provides motivational energy, decreases depression and anxiety, erases a sense of isolation and greatly assists several biological, health processes. Usually that makes getting yourself well heard quite uplifting. It also tends to produce a greater clarity of thinking and an increase in person’s sense of self-worth and general significance. If you want to have a sense of belonging and being part of a community, first do a good job of being a good listener and then occasionally do a good job of getting yourself heard. That will help with your connectedness as you hone your interpersonal interaction and communication skills with that community. As you may have guessed by now, there are not a lot of people who truly are good at hearing others well. If you think just because someone loves you they are able to hear you well, you are likely to be wrong. Listening well and especially listening with love is not a skill commonly learned. A few learn it growing up in a loving, listening well home. Some others learn it in schools that teach counseling skills. Some stumble across it accidentally but may do it clumsily. Everybody else has to apply themselves and learn to listen well with love – purposely. This is where you and healthy self-love can come in. By getting yourself well heard, you help yourself and those you love do your love relationship better. Of course, you must do your share of hearing well those you love to make it really work. Now that I have explained what I think is hearing well is, let's start with the basic how to's. With healthy self-love, take responsibility for getting yourself heard well. How do you do that? By asking for what you want directly, clearly and lovingly (see “Requesting Not Expecting – A Love Skill”). By reading this mini-love-lesson, you may know more about loving listening than anyone you know. That means you are on the way to being able to ask for it, and describe what it is you want more exactly. I suggest you take the position that, as an adult, it is your job to go after what you need, what you can use, and what you want, including being well listened to. The simplest way to do that is to straightforwardly ask for it, describe it and then interactively cooperate in making it happen. You also can do this a bit more diplomatically. 1. You might say, "I've been thinking that I don't do a very good job of getting myself really listened to, and I want to feel very listened to, so I'd like your help in getting there. Would you be willing to help me with that?" Probably, do not say something like, "You have never really listened to me and I hate you for that!" 2. You might say, "I've been reading about how many couples don't listen to each other very well because they don't know how. Did you know couples and families even get physically healthier and feel much more loved (even those that already are pretty okay) as they work on their listening skills together? How about we work together on that?" Probably, do not say anything like, "You probably wouldn't ever be interested in learning how to talk about your feelings and my feelings in our relationship, right?" 3. You might say, "I hear lots of couples are getting into this thing called loving listening and it's making their relationships even better. Let's read up on that and see if we want to do the same, okay?" Probably, do not say anything like, "You are never going to learn how to communicate with me, are you! You don't really love me enough to do anything like that, do you?" The best way to make your request, is with love. If you use loving tones of voice, loving facial expressions and the best words you can figure out to say, if you talk about wanting to feel truly heard, really deeply well heard and lovingly heard, you might just have started on a good trail with anyone who loves you. What can go wrong? Lots. What if the loved one you are talking to feels accused and says things like "don't you think I hear you well enough” or “you don't listen to me either" or something else negative? Well, that brings us to the next point of getting yourself well heard. Before you ask to get really heard, and with love, it helps a lot to start working on and really striving to better hear those you love. The adult principle is if you want it, become willing and able to give it. To do that, you must study and practice -- part of which you are doing by reading this mini-love-lesson. Keep it up. Learn more. The next good thing to do is to ask to be heard really well as you also offer to do the same with the person you are asking. Then suggest that you work on it as a team studying, coaching and helping each other learn better to lovingly listen better to each other. You can practice on each other and on others like your children, family, friends, etc. Maybe Another Way to Start Getting Yourself Better Heard? How about starting on this by going to one or more friends, family, special other, etc. and say you read this thing about getting well heard and would like to hear their ideas about it? In the process you might introduce them to our mini-love-lessons designed to help people go about love in ways that work better and better – okay? There is so much more but hopefully that is enough to begin with. If we listen with our hearts, and not just our heads, do we hear a fuller and finer truth?